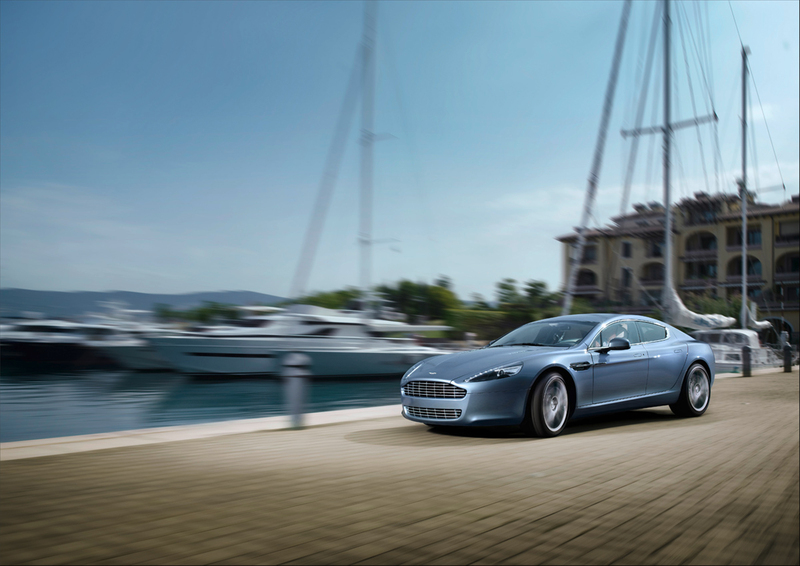 Power, Beauty, and Soul: the core values of Aston Martin that have been captured in the marque’s first ever four-door sports car, the Rapide. Seating up to four adults the Rapide provides a unique Aston Martin driving experience for all four passengers. 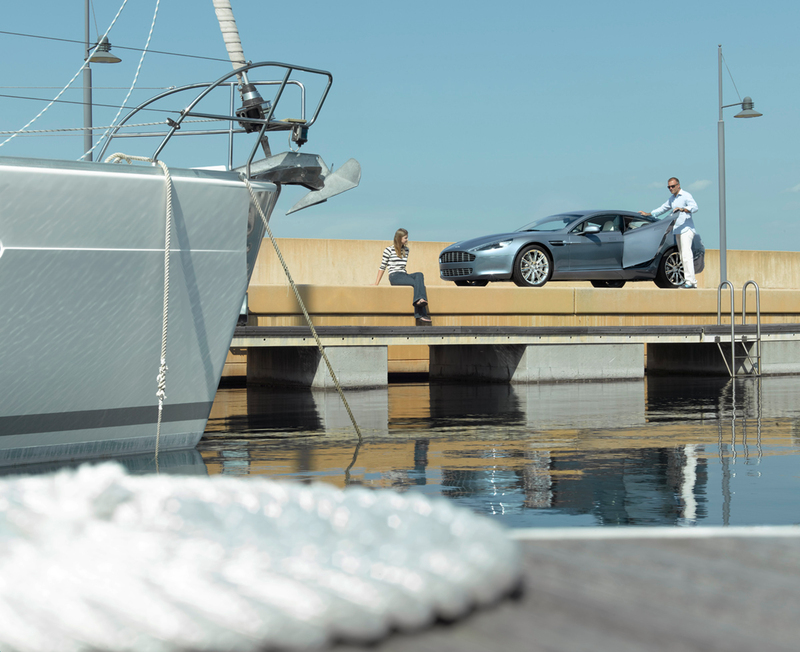 Muscular and elegant, the design of the Rapide can only be that of an Aston Martin, and aims to be as much as sport coupe as the rest of the lineup. 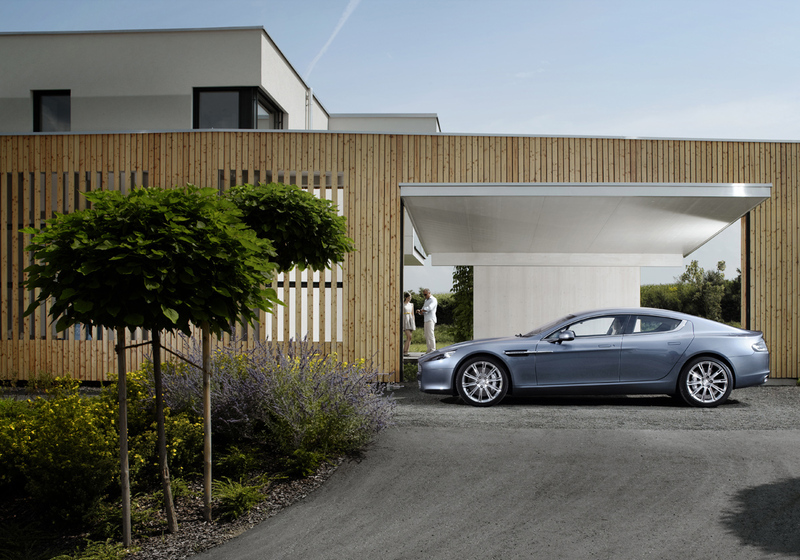 “Like a race horse standing still, you can see its power and elegance…” proclaims Director of Design, Marek Reichman, “…the shape of Rapide’s rear haunches are muscular conveying the power that lies beneath while its low stance produces a powerful look.” The four “Swan Wing” doors open at an angle of 12 degrees to allow easy accessibility and prevent door impacts. A clean, couple-like design has been achieved using a low roofline along with the absence of a visual B-pillar. Single bi-xenon headlights, light tube sidelights, and the recognizable C-shaped tail lamps housing 360 LED’s each give the Rapide a commanding presence on the road. Hand built in Köln, Germany is the 6.0-liter V-12 producing the unmistakable exhaust note of an Aston Martin. The front mid-mounted engine produces 470 bhp at 6,000 rpm and 443 lb-ft. of torque at 5000 rpm, resulting in a 0-60 time of only 5.1 seconds and a top speed of 188 mph. 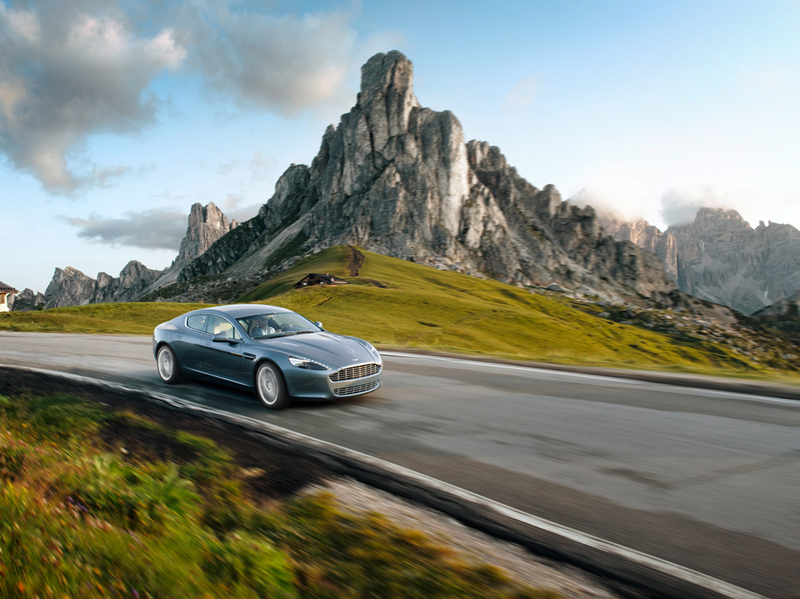 Testing of the Aston Martin Rapide was conducted at the famous Nürburgring in Germany and the Nardo proving ground in Italy where engineers were able to fine tune the driving dynamics of the sedan. The Touchtronic 2 six-speed automatic transmission is mounted transaxle to help achieve a driver-oriented weight distribution of 51:49. Gear shifts can be controlled by the driver via column mounted, leather trimmed magnesium alloy paddle shifters. The hand-built Aston Martin Rapide interior has been designed to give all passengers an involved driving experience by providing passengers with as much front and side visibility as possible along with a center console that extends to the rear seats. 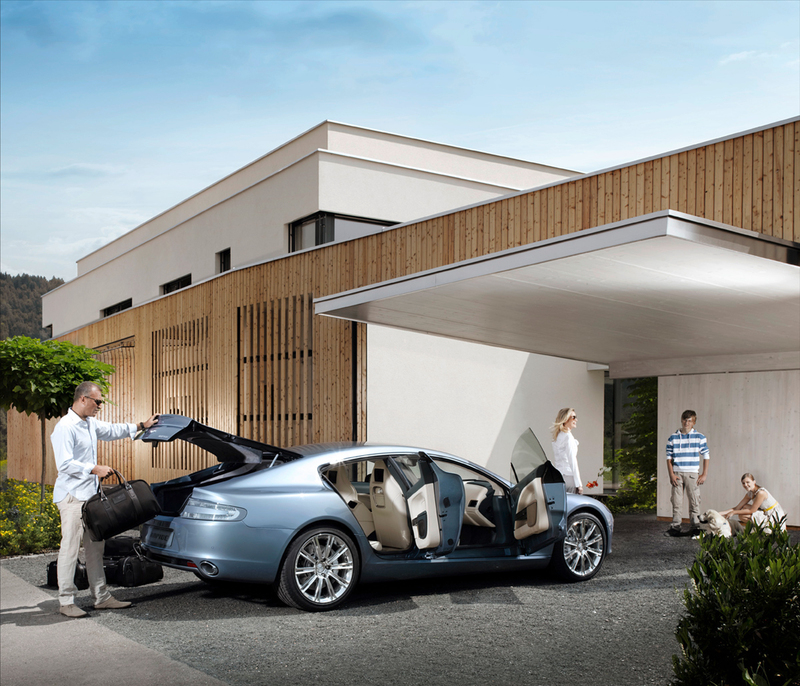 The Rapide supplies passengers with a practical and useable rear seat, with ample head and legroom for adults, as well as 11 to 26 cubic feet of luggage space. Standard is the 1,000-Watt, 15-speaker bespoke Bang & Olufsen BeoSound Rapide sound system featuring two Acoustic Lenses that rise from the dashboard. A two-screen entertainment system is optional and uses a six DVD multi-changer in the luggage compartment and wireless headphones. Width (including mirrors): 84.3 in. What do you think of the Aston Martin Rapide?